As a full-service industrial inkjet integration company, we will work with you and your engineering team to assess your requirements, determine whether inkjet technology is a viable solution for your application, and to conceptualize, design and implement a solution that works for you. We are dedicated to developing positive, collaborative, confidential relationships with our clients. By working closely with you, step by step, we can help you take your application from conception to implementation. 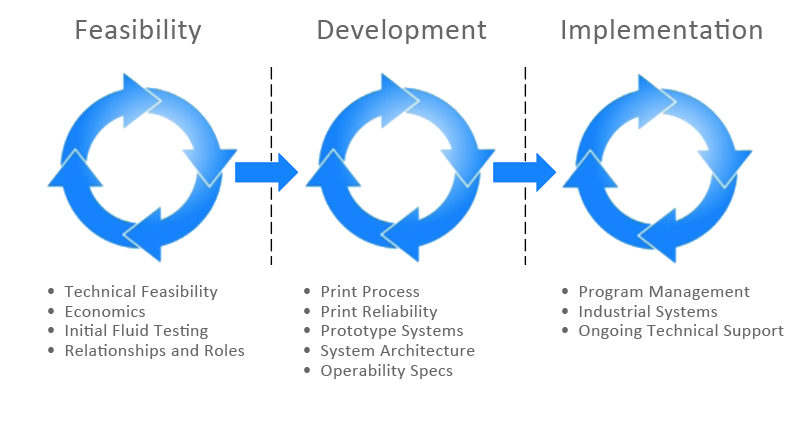 Integrity’s inkjet integration projects typically include several interconnected and iterative phases. The first step towards successful implementation of inkjet technology is to fully understand and parameterize each specific application. Integrity works with you to gather general and specific information about your application and providing answers to both general and specific questions pertinent to the implementation of inkjet. We consider all aspects of the system – not only mechanical, electrical, and software but also nature of the fluid, the substrate, and the interaction of the two. The end goal of any inkjet system is to deposit a fluid on a surface to create a specific effect. To that end, the fluid used for your application not only needs to meet your performance parameters, but also needs to meet all criteria required for precise and repeatable deposition by inkjet. The Ink and Fluid Process experts at Integrity have the chemical and fluid dynamics knowledge to create the optimal balance between performance parameters and reliable jetting. In cases where deficiencies are discovered, the Integrity team works with you to implement chemistry improvements to assure optimum performance. Following fluid optimization, the next step is to determine the appropriate inkjet process and deposition methods to meet your application needs. Integrity has a versatile array of tools and test beds to determine the best printhead, optimize the deposition method (single pass, scanning, etc. ), evaluate drop volume effects, and determine the appropriate laydown order in the case of multiple fluids or process color. The final aspect of bringing inkjet to your application is the design of a complete system. Integrity uses the knowledge gained though application, fluid, and process assessments to engineer a system that fits your needs as well as your budget. Our engineering team starts with Integrity’s standard modules and building blocks to create the core of the system and then creates specific parts and components to bring the whole system together. We create, assemble, and install systems at every level, from Lab/R&D units to production scale equipment for manufacturing purposes. Contact us to find out what we can achieve together.